Join Cynthia as she teaches her signature style of colored pencil painting with this elegant, classic still life. 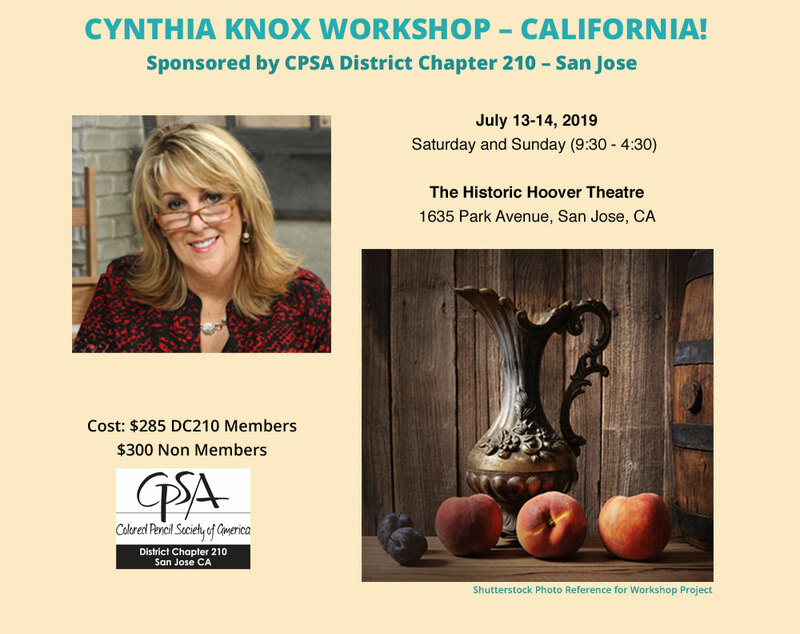 You will receive a beautiful fully illustrated booklet along with a packet that includes the lightly traced project surface, an informative handout, Cynthia’s popular “Cheat Sheet”, and other materials for this workshop. EXPECT TO LEARN, LAUGH, AND LEAVE WITH NEWLY ACQUIRED SKILLS AND A STUNNING PROJECT! Over the two days, Cynthia will teach a basic techniques session and demo each texture observed in this still life, including the background. She will provide individual instruction for each student frequently and will be available online for follow-up assistance after the workshop has ended. For additional Testimonials, please see Testimonial page. Cynthia Knox, CPSA, is a colored pencil and graphite artist who lives in New York with her family. Her artwork has received numerous awards in national and international juried exhibitions, and she has published over 13 art instructional books and kits. Her current book, “Contemporary Still Life in Colored Pencil,” is scheduled to be released later this year by Ann Kullberg Publishing and is the companion to her bestselling book, “Classic Still Life in Colored Pencil.” Cynthia teaches art workshops for individuals and large groups within and outside the United States and has three online classes with Craftsy.com currently exceeding 11,000 students. Please visit www.cynthiaknox.com to learn more about Cynthia and see her artworks. Lunch: Provided on Saturday and brought by each artist on Sunday.